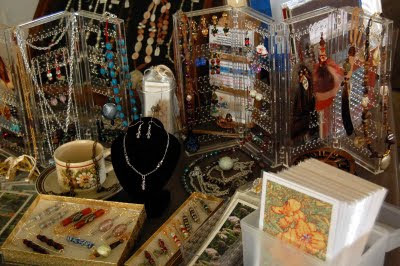 I’m going to “get my feet wet” and participate in a local craft fair. If you have wondered what my handmade items look like in person and/or if you want to give me some moral support and you are local to the DFW Metroplex, I would love to have you stop by. I have been adding to my inventory and tagging my items in preparation. I have set up a display in my living room to get an idea of how to arrange/display my items. (You can click on the images in this post to enlarge them.) There will be several items at the craft fair that are not listed in my shop, as well as all of my handmade items that are currently listed and don’t sell before the craft fair. 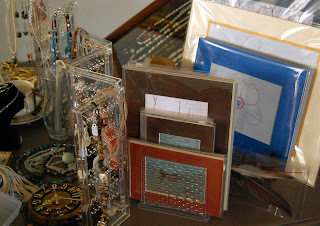 EDC (Eclectic Design Choices) will be sharing table B-20 with Earlene Moore of Breads & Moore. Please stop by and say hi. In order to repair our broken waterfall seal, we had some more disassembling to do. We took off a few layers of rocks directly below the spillway. This gave us access to the screws, or I should say what was left of them, that held the pond liner in place. The liner was sandwiched between the waterfall container and the molded, heavy black plastic spillway piece. Most of the screws, as well as about half of the metal sleeves that they screwed into, had corroded over the years. Once we managed to free all of the pieces, we were able to tell that the root came from the tree at the base of the berm and not the rosemary at the top of the berm as I had initially surmised. We clipped the root and had to remove the bags of lava rock from the waterfall container to get it all out. This prompted some needed maintenance, as much sludge had accumulated in the container over the years. We hosed off the three mesh bags full of lava rocks and the three large fiber filters at the bottom of the container. That wasn’t the end of the sludge however. Luckily we have a wonderful Oase pond vacuum that we used to remove the rest of it along with hundreds of empty pond snail shells. 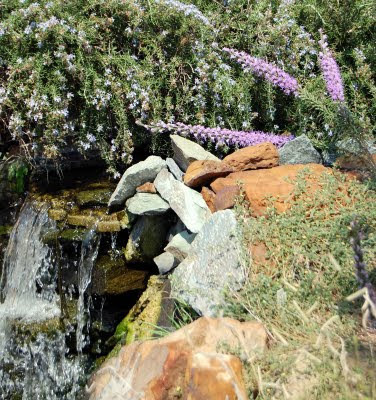 In order to remove as much tree root as possible, so that this problem didn’t come right back, we moved the three large boulders to the right of the waterfall and the small rocks that rested on them. I dug back as far as I dared in the clay of the berm and clipped the offending root. Now we were finished disassembling and could begin the process of reassembling. I started by compacting the clay back into the hole in the berm that I had created when removing the tree root. Other than the lava rock bags being heavy, putting the filter system back together in the waterfall was easy. Next we had to figure out how to put everything back together at the spillway to create a good watertight seal. My husband found stainless steel bolts that would screw into the remaining sleeves or fasten with a nut in the holes where the sleeves had disintegrated. Just the compression provided by these screws would not have been enough however. After one false start to create a watertight seal we got the help we needed from Whiz Q Stone, a local stone yard and pond and landscape supply. 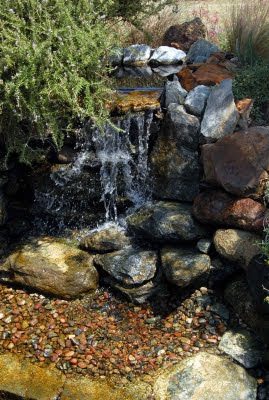 From Whiz Q Stone, I bought the seam tape, seam cover tape and primer from Aquascape Designs that I needed to create a watertight seal between the plastic waterfall pieces and the heavy EPDM pond liner. The primer causes the surfaces that you put it on to meld into each other to create a watertight seal. It worked like a charm. If you take on a project like this, make sure you read the label and take appropriate precautions when using these products. Next, the rocks had to be put back. They never go back exactly like they were before. Part of this is because heavy puzzle pieces are difficult to manipulate and also because there is more than one solution to the puzzle. I filled large voids with black waterfall foam that is available even at your local hardware store. Almost done now, I just needed to add some water and water conditioner before turning on the pump. Everything worked perfectly and better yet, after several hours there were no wet spots in the garden or bubbles under the liner. One day my husband came in and asked if we had had much rain earlier that day. It turns out that when he pulled a couple of weeds near our garden pond and waterfall, he found the ground to be rather wet. 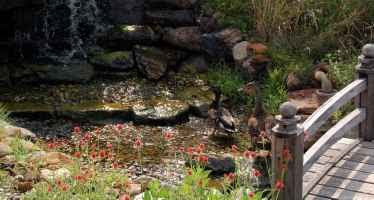 We had not had any appreciable rain and as we investigated further, it turned out that there was some standing water in another area of the garden and “bubbles” under the pond liner in the stream section. I had seen these bubbles before, only much worse, shortly after we had had the pond installed. 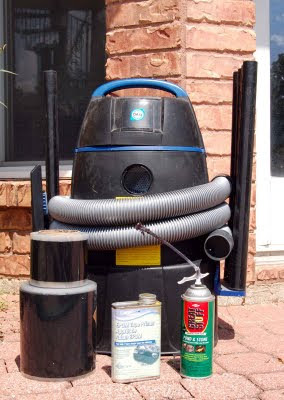 At that time they were caused by an uneven settling of the waterfall filter container that allowed water to pour over a back corner and get under the liner. We decided to turn the pump (waterfall) off overnight. In the morning there was no standing water and no bubbles. We turned the pump back on in the morning and within a few hours the bubbles and standing water were back. Now we knew that when the waterfall was off, there was no leak. The hunt was on for the source. Water was flowing properly from the waterfall container and not over a back corner as it had previously. As we traced the wet soil, it continued up the berm towards the waterfall. Finally it looked like the only way to trace the source further was to turn off the pump again and disassemble the waterfall. When we lifted off the fake spillway rock, we found the culprit. A root of a nearby tree had worked its way between the pond liner and the waterfall filter container, breaking the seal and allowing water to seep under the liner. Now all we had to do was fix the broken seal and we should be back in business. This was easier said than done however. I’ll explain the process in my next installment. I’m sure you have torn off pieces of paper to mark your place in a book or magazine. I have. I have also had them fall out and litter the ground thereby losing my place. If this has happened to you, you need something better suited to the task. I have a more permanent solution for you, photo art bookmarks. I am excited about my new offering. These bookmarks are thin enough to be kind to your book while saving your place, yet substantial enough to make it easy to turn to your marked page. Not only are they functional, but they are small pieces of art. 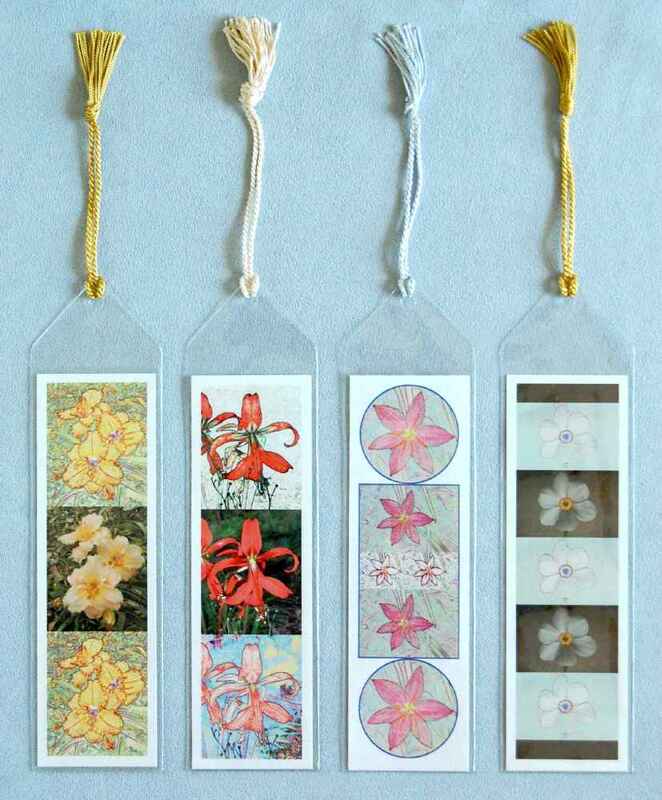 I have adapted some of my altered photo wall art offerings and note card designs as well as creating photo art designs just for the bookmarks. 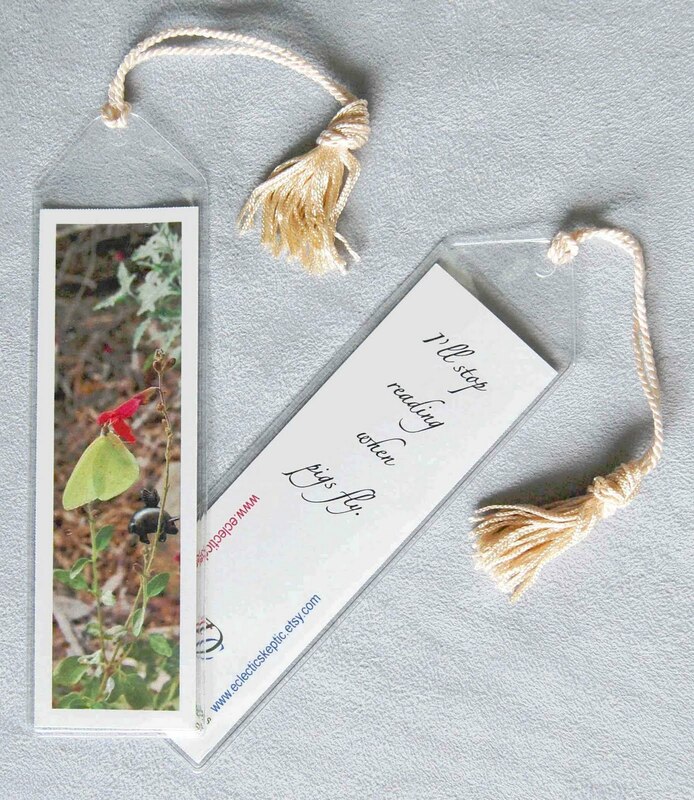 The back of each bookmark includes a short saying. Bring a little art into your life or give these mini art bookmarks as gifts. They come in two sizes. It is only September, however many people are already thinking about Christmas and these bookmarks would make great stocking stuffers.